Located in the heart of London this cooperative non-profit is unique. Managed and owned by the members, the shop operates on a membership system, it offers local and seasonal products for the lowest prices possible. Design agency Unreal was responsible for developing its branding, with in mind the low budget constraint of the cooperative. For the people, by the people. Set up in Spring 2010 by chef Arthur Potts-Dawson, retailer Kate Wickes-Bull and an army of others, The People’s Supermarket is a community-based shop that’s managed and owned by members and open to all. It’s based just around the corner from Unreal’s studio, on Lamb’s Conduit St, London WC1 and takes its format from the popular co-operative ‘Park Slope’ in Brooklyn, NYC. In addition to the membership scheme, much of the produce in the shop is locally sourced, seasonal and sustainable, meaning they stock the best food at the lowest possible prices. The story of the supermarket will be broadcast in its own Channel 4 documentary, due to air in early 2011. The People’s BrandAfter approaching the Supermarket to design some launch posters, we were tasked with developing the brand, which needed to reflect the co-op’s core values of being communal, affordable and democratic without appearing too virtuous or elitist. A full identity program was required including logo, stationery suite, advertising, packaging and brand guidelines. via The People’s Supermarket [Branding] | Trendland: Fashion Blog & Trend Magazine. 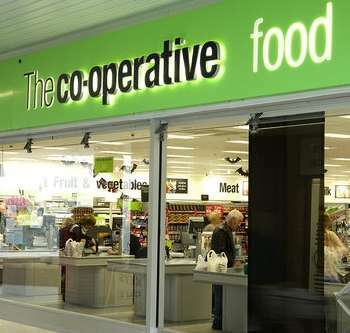 A multi-million dollar deal has been recently signed between Co-op UK and Nualight, a specialist in LED lighting for the food retail sector, to install its LED lighting in freezers and ice-cream cabinets throughout 800 UK-based stores owned by the Co-operative Group. LED lighting will be installed in the doors in low-temperature merchandising cabinets and in ice-cream display cabinets throughout the stores. “The motivation for introducing Nualight’s LED lighting solutions to our stores arose primarily from our unique commitment to sustainable retailing practices,” explained Alex Pitman, Energy and Carbon Manager at the Co-operative Group. Ferrero, followed by BMW, and Barilla, are the company whose brand reputation has been rated the best one in Italy by the last “Reputation Pulse 2011″survey, the most important and extensive national research about company reputation conducted by the Reputation Institute in partnership with Doxa. The Reputation Institute, the main structure at a worldwide level dealing with issues such as corporate branding and reputation management, has been helping in the last 15 years more than 200 companies to measure, understand and enhance their potential in terms of reputation. Every year the Institute carries out a research at a global level about company reputation and the factors affecting it, surveying more than 1500 companies from 32 countries. The Reputation Pulse Italy is produced in partnership with Doxa and examines more than 120 companies operating in Italy ranking them following a reputation criteria, with a score ranging from 1 to 100. The survey had been carried during the first three months of 2011, with more than 3,000 people interviewed. So this year is Ferrero standing at the top step of the podium (with a score of 81.68), closely followed by BMW (81.19) and Barilla (81.16), with only three companies achieving a score of ” reputation of excellence “(over 80). Further down the rankings there are companies like Armani (78.90) ranked fifth, Luxottica (75.56) eight, Coop (73.54) fifteenth, Pirelli (72.55) 17th, followed immediately by Benetton (72.42), 18th. The “top 20” companies outweigh the positive threshold of 70 points, the remaining companies are hardly reaching that level: of the 124 firms surveyed, only 30% are showing a score higher than 70. The 2011 survey considered only the companies amont the 100 rated in Mediobanca’s annual report about the “Leading Italian Companies”. The Pulse Reputation Italy survey has also expressed an evaluation in terms of gain or loss of reputation as compared to year 2010: Alitalia sees the highest score reputation increase (+12.8 points), followed by Intesa Sanpaolo (+ 7.1) and Unipol (+6.5). Mediaset (-10.7) with Lottomatica (-10.6) and Mediolanum (-10.2) are the protagonists of the worst loss of reputation, with a drop of about 10 points compared to 2010.